Imagine a utopia where residents drive off their choice of fifty golf courses, run errands in a themed town square and head over to meet their friends for afternoon happy hour all in one golf car trip. Every. Single. Day. 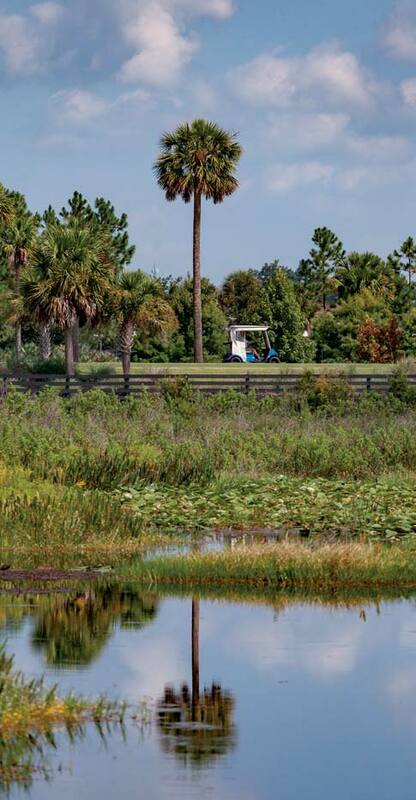 This masterplanned paradise exists smack dab in the middle of Florida. “I live in the bubble. I can drive [my golf car] all over The Villages. Everything is located here in the bubble,” says Stefannie Krieg, manager of The Spice & Tea Exchange in Brownwood Paddock. 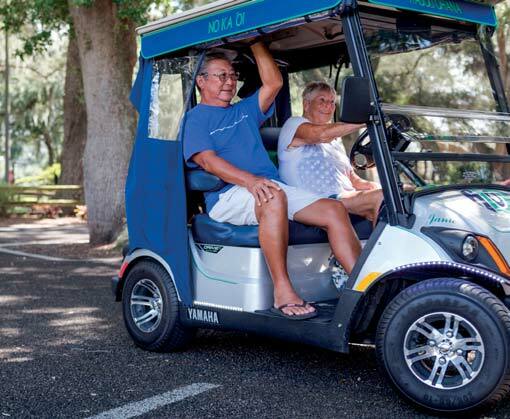 “I use my golf car for everything – the grocery store, work.” Founded over thirty years ago, The Villages continues to expand its borders as more and more 55+ adults flock to a life of convenience built around over a hundred miles of golf car paths that provide access to every amenity imaginable. 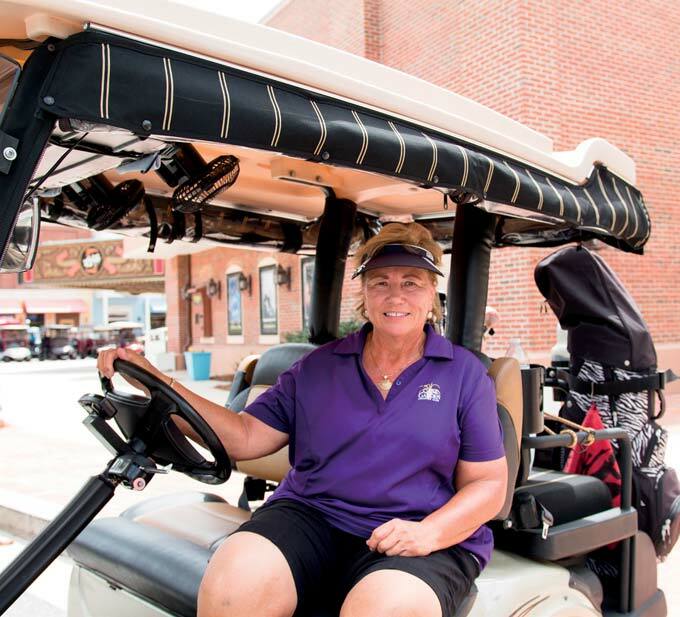 “I don’t need to go anywhere else, and most of my errands can be done with my golf car,” says full-time resident Brenda Westfall. With tens of thousands of golf cars cruising around, customization is big business for local dealers. The majority of customers desire versatile cars that go from the course to the town. Everyone we asked was happy to show us the customizations that make their car perfect. Which accessories do Villagers have to have on their cars? Anything to keep drivers and passengers cool is top on the list. “Our vented windshields are a Godsend,” Brenda raves. 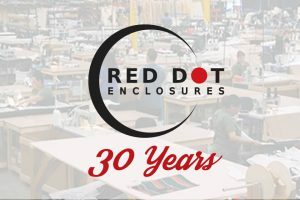 “When it rains, you still get some ventilation.” Enclosures are also a must, especially for full-timers who need relief from Florida’s warmest and wettest months. Preferences vary from the track-style, roll-up variety that is easy to change out to the more permanent hard shell versions. 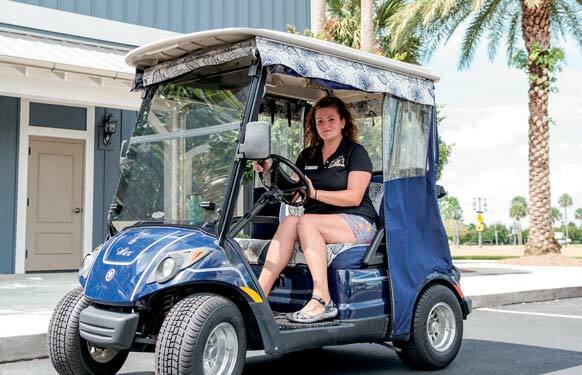 Safety is also a key factor when golf cars mix with traditional automobiles, and these accessories blend in seamlessly to coordinate with a resident’s ride. Colormatch LED light strips mounted to fenders are not only stylish, but are essential when leaving a parking space. “It’s hard for people to see us when we back out of a parking space in the square,” explains Mike Westfall, Brenda’s husband. Mike is also a fan of side mirrors mounted on the inside of the cab to prevent clipping in tight quarters. Other items that make Villagers smile include matching wheels, fans, and USB chargers. 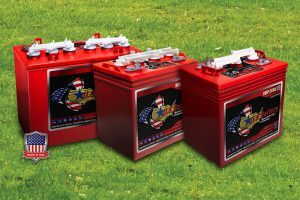 The Villagers GCN talked with did not have too many things they would add to their cars – once residents purchased their cars, they quickly customized them to fit their lifestyles. As Brenda puts it, “When you get as old as us, hey, life goes on.” And when you’ve got a souped up golf car that takes you everywhere you want to be, life in the bubble goes on like another day in paradise. 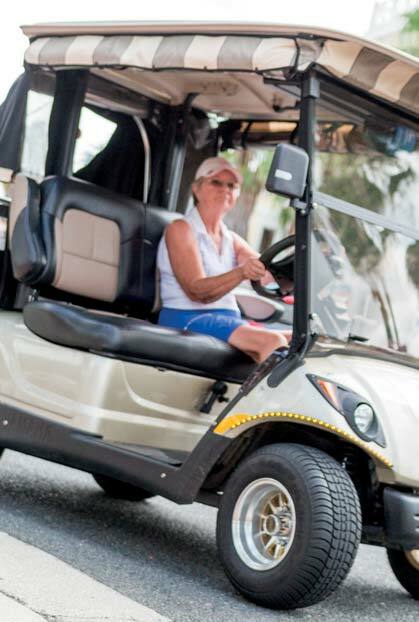 Some people wear their hearts on their sleeves, but residents of the Villages use their golf cars to show off their passions. Take a look at our friends from the Villages, and see how their personalities are reflected in their cars. GCN caught up with friends Joyce Scules and Judy Bordenbaum on their way to City Fire in Lake Sumter Landing after a day on the links. Both ladies drive gas-powered Yamaha G29s with matching seat covers and enclosures. Judy’s 2-seater was hauling her golf clubs and a much-needed cooler. Joyce was proud to show off he fan system she rigged up herself. In Spanish Springs, we met up with a large group of friends taking advantage of Amerikano’s early happy hour. 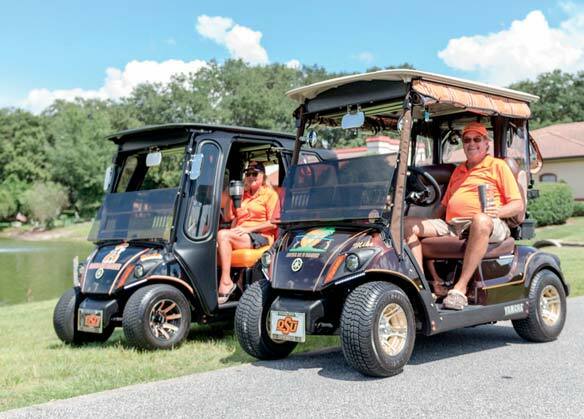 This group, who moved to The Villages about a year and a half ago from different parts of the country, has a lot of pride in the personalization of their Yamaha Drive2 golf cars. Ron and Jane Okazaki moved to Florida all the way from Hawaii, and their car reflects their Hawaiian roots with custom decals and enclosure. Jerry Dillon has tastefully decked out his car with Ohio State colors and a vented windshield to let in the breeze. Brenda and Mike Westfall have his and hers cars. Both big Oklahoma State fans and golfers, the Westfalls have similar themes for their cars. Living here full time, Brenda and Mike both have vented windshields, and Brenda opted for the hard shell enclosure to keep out the elements. Stefannie Krieg, manager of The Spice & Tea Exchange in Brownwood Paddock, sets her car apart with a tropical vibe. “Everyone has stripes, but I wanted something different.” Stefannie is in the market for a newer model used Yamaha gas car. Her dream feature would be to have a fuel gauge, so she’ll never have to guess on when to fill up.